As a Collegiate School program, Geronimo has access to high quality fields and the ability to maintain our schedule consistently. Geronimo is open to players from all schools. The 2015 Geronimo experience for players, parents and volunteers will be consistent with the experience of years past. Andrew Stanley serves as the Executive Director of Geronimo Lacrosse. Spotty Robins, Geronimo's Program Administrator, is responsible for the registration process and program organization. Our registration process is 100% online. Please follow the specific instructions under Register Online to begin the process. Fees should be paid by credit card. We will confirm your registration via email. Each Geronimo program is subject to enrollment limitations and will be registered on a first-come, first-serve basis. Enrollment limits are set based on facility and coaching constraints. Geronimo does not allow players to "play-up" a division regardless of age or repetition of grade. Geronimo does not accept team requests. Should a family's plans change, a partial refund of registration fees can be requested up to February 15. After that date refunds will not be possible as program arrangements must be finalized for the coming season. 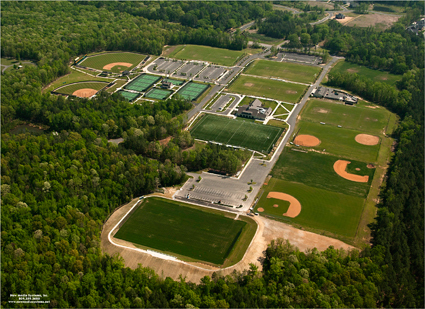 The Collegiate School Robins Campus (above) houses the majority of Geronimo programs. All Geronimo players will be automatically registered with US Lacrosse and will receive supplementary insurance coverage, a subscription to Lacrosse Magazine, and other benefits. Schedule conflicts and weather may result in some sessions being canceled or rescheduled. Weather patterns are different each year, and some years we get more rain than others. We must consider the fact that our facility is home to one of the larger scholastic athletic programs in the state and is in use seven days per week during the spring season. When feasible, we will reschedule rained out sessions. Any decision made - at the discretion of Geronimo and Collegiate School leadership - will be made and communicated in the timeliest manner possible. Please check your email prior to each session for a schedule update. Follow @geronimolax on Twitter for updates. For details about these policies and procedures please contact Geronimo Executive Director . Our goal is to make lacrosse an enjoyable and fulfilling experience for our players. Geronimo appreciates the support and feedback of players and parents. Please feel free to call or with suggestions or feedback.